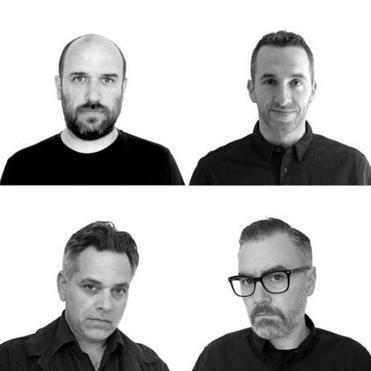 The songwriters David Bazan, Trey Many, and Tim Walsh are confused why I’ve asked them to discuss their new band Lo Tom for a feature in a major US newspaper. They’re not unaccustomed to dealing with the workaday aspects of album promotion. Bazan has both incensed and delighted critics since releasing his first music in 1997, and Many is a booking agent for the indie heavyweights Fleet Foxes, Beach House, and Perfume Genius. Walsh has mastered records for, among myriad others, Sufjan Stevens and the Shins, and Lo Tom’s fourth member, Jason Martin — in absentia on this call — has fronted the wildly underappreciated California band Starflyer 59 since the Clinton administration. Moreover, according to a press release detailing Lo Tom’s self-titled debut, the foursome have a combined 125 years of music industry experience, a fact that wasn’t lost on journalists at NPR and Paste, nor others who giddily noted their arrival. This isn’t, in other words, the first time the foursome — performing together or apart — has incited curiosity in a journalist. So why the slight confusion? “Honestly, I don’t think any of us thought Lo Tom would have the public life that it does,” says Bazan, 41, whose erstwhile band Pedro the Lion was visible enough to be covered by The New York Times, ABC News, and Pitchfork during its run from 1995-2006. Still, he says, the foursome’s goals were modest: Sell Lo Tom’s eight-song album online and hope that revenues would cover the cost of making it. Full stop. It wasn’t “part of the chess game,” Bazan continues, to speak about the band on a conference call with the Globe. The idea was to form a Rotary Club for aging parent-musicians who rarely see their friends. “It’s more like we made a record instead of going fishing,” clarifies Many, who, like Martin, lives in Southern California. His comment was made in jest, prompting a winding aside about mens’ retreats, Heaven’s Metal magazine, Christian rock festivals, and whether or not U2 is a “real band.” But the digression also pointed to the long-suffering friendships that underpin Lo Tom, and to their context: a late-’90s alternative music scene with loose ties to evangelical Christianity. This history of this scene is fascinating and too complex to parse here, but suffice it to say that Lo Tom isn’t a “Christian band,” nor are all its members Christians. Moreover, these ties were often oversold by journalists with voracious appetites for narrative. Still, Lo Tom wouldn’t exist if, say, Many’s shoegaze band Velour 100 hadn’t stumbled upon a foul-mouthed Pedro the Lion rehearsal at a Seattle house show in 1996. (Bazan used a common four-letter expletive in a prayer to God — impressing Many.) Or if Martin hadn’t approached Many at the Christian music festival Cornerstone with a Heaven’s Metal centerfold of himself. The gesture was a light attempt to woo Many’s band to Tooth & Nail Records — equivalent, for a time, to Sub Pop in the “Christian music” underground. Even the mention of U2 invites holy connotations, seeing as evangelicals have for decades tried, and sometimes succeeded, to mine Bono’s lyrics for gospel-minded themes. Lo Tom also wouldn’t exist if Bazan, Walsh, and Many hadn’t grappled with the difficulties that often attend playing music with friends at professional scale. “Fewer moving parts means fewer broken pieces,” Bazan sang on his solo debut in 2006, referencing the litany of ex-bandmates he’d piled up over the years — including Walsh and Many. The two were key fixtures in Bazan’s universe during Pedro the Lion’s rise, touring widely with him and, in Walsh’s case, moving across the country — from Boston to Washington state — to officially join his band. A couple years later, however, financial and existential strains brought Pedro the Lion to an end, putting a once deep friendship between Walsh and Bazan at risk. They rekindled in 2009, when Walsh helped Bazan make his career-defining record, “Curse Your Branches” — a meditation on lost faith that echoes Leonard Cohen — and, now they’re here, in 2017, placing sunglass-wearing chihuahuas on the cover of an album. Because what good is a chance to get away if you can’t get away with that? Lo Tom is a respite, a space for these long-entwined, continent-divided 40-somethings to jettison their roles as mastering engineers and Serious Songwriters, fathers and husbands, believers and searchers to, in a word: play. To suspend the reality of what it entails to release an album when listeners associate heavily loaded sounds and ideas with your names. Except, try as they might to diminish expectations, Bazan, Walsh, Many, and Martin are too self-conscious about good songwriting to make an album for their own private entertainment. Lo Tom distills, fuses, and enhances what each member does best, smearing Bazan’s novella-fine, world-weary scenes — think “Revolutionary Road” with characters more soused on bourbon — atop versions of blue-souled, pointillist rock that all four have rummaged and tweaked since the mid-’90s. And, regardless whether they meant to be wallflowers, of course journalists noticed when these particular dads made music together at all.